Pocket-sized and minimalist, the open design of Kabrio neatly houses a full sized capless rollerball refill for long life and ultra-smooth writing. The ergonomic grip sections on anodized aluminum are lightweight, durable and utterly functional. Each Kabrio is handmade in Italy by Parafernalias renowned design team and fills with Schmidt 8126 long capless refills. Pocket-sized and minimalist, the open design of Kabrio neatly houses a full sized capless rollerball refill for long life and ultra-smooth writing. The ergonomic grip sections on anodized aluminum are lightweight, durable and utterly functional. 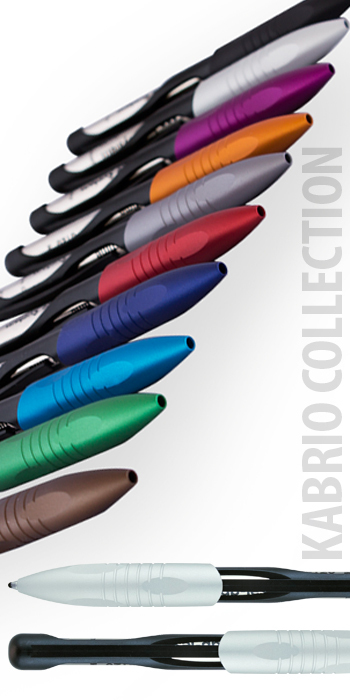 Each Kabrio is handmade in Italy by Parafernalias renowned design team and fills with Schmidt 8126 long capless refills.